Mumbai: Defaults on rated debt instruments are growing at a fast clip this year compared to last year, according to data from two of the country’s largest rating agencies, suggesting stress on corporate balance sheets remains high. Some say such defaults may not have peaked particularly in the case of large corporates which have taken on excess debt to expand operations before the economy hit a rough patch. The economic downturn of recent years and delays in government approvals stalled many infrastructure projects, which in turn, hurt corporate cash flows and impaired the companies’ ability to repay debt. This has led to a build-up of bad loans across the country’s banking sector and led to defaults on market borrowings. While banks classify a loan as a non-performing asset if repayment is delayed by more than 90 days, rating agencies downgrade a debt instrument even if repayment is delayed by a single day. According to Credit Rating Information Services of India Ltd (Crisil), debt in default was at ₹ 25,895 crore as of September 2015 compared to ₹ 28,323 crore for the full year in 2014. This suggests the monthly run rate of defaults is higher than last year. The stress is more evident in India Ratings and Research Pvt. Ltd data, which shows debt in default jumped to ₹ 21,457 crore as of 8 December from ₹ 9,035 crore in 2014. The other two of India’s largest rating agency firms—ICRA Ltd and Credit Analysis and Research Ltd (CARE)—refused to share debt default data. “These predominantly include small entities but also include large corporates where financial restructurings have not worked out. It reflects a combination of stress in cash flow generation given disinflation and high leverage," Rakesh Valecha, senior director and head of corporate ratings from India Ratings, said. He added that most of these defaults were in the non-investment grade segments. The data provided by the two rating agencies shows that the number of defaults hasn’t risen that dramatically, suggesting that higher value credits have gone into default this year. This is in keeping with the view that the debt problem in India is concentrated in a relatively small subset of companies. Based on an analysis of 3,000 listed firms, Goldman Sachs noted that half the debt is held by 1% of the firms and concentrated in the industrials, utilities and materials sectors. The top 10% of companies hold about 90% of total debt, it said in a report on 9 November. For the year 2015 up to 8 December, India Ratings assigned a default rating in 36 cases unchanged from that reported in 2014. 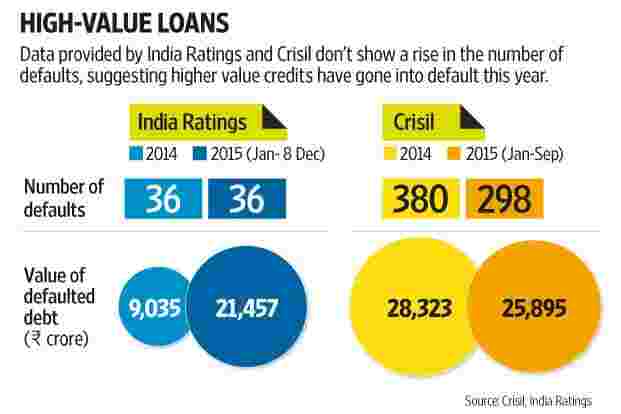 Crisil reported 298 cases of default up to 30 September 2015, against 380 reported for the whole of 2014. Considering a monthly average, the number of default cases in 2015 would be marginally higher than 2014 for Crisil. On 11 April, ICRA downgraded GMR Group’s power projects with a debt of $2 billion to default rating. Debt-laden Jaypee group alone contributed ₹ 49,038 crore to the total default reported in 2015. In July, CARE Ratings assigned a default rating to a number of debt instruments issued by Jaypee group companies on account of delay in servicing of debt obligations. On 19 October, India Ratings also assigned a default rating to a number of instruments issued by IVRCL Ltd as well. “The quantum of non-performing assets reported by banks is higher than what we see as defaults announced by rating agencies. There is a huge possibility the default numbers would be bigger if one had to consider suspensions and withdrawals data," said Amit Tandon of Institutional Investor Advisory Services, a proxy advisory firm. According to Prime database, ratings on instruments worth ₹ 2.75 trillion have either been suspended or withdrawn by rating agencies since April. Of these, ratings on instruments worth ₹ 5,450 crore were suspended. The data, however, may not present a clear picture of stress as it also includes withdrawal of ratings on debt that has been repaid. Valecha agrees there could be more defaults before there is a meaningful turnaround. “There is still more stress left in the system, but we expect this to be more in entities (including large corporates) which are rated in the non-investment grade. The path to recovery is likely to be a prolonged one," he said. To be sure, while stress in the system remains high, there are some indicators which suggest signs of improvement. According to a Crisil study for the April-September 2015 period, the ratio of upgrades to downgrades improved to 2.1 times as against 1.7 in fiscal 2014-15. Reserve Bank of India data released on 3 December also shows a marginal improvement in interest cover ratios as the year-on-year growth rates in interest expenses fell slightly in the July-September period. “We are probably in the last leg of the impairment cycle, but this leg is going to be a lot harder to predict. It pertains to the large corporate book and sectors prone to large borrowings and have delayed payment of their underlying borrowings," said Kotak Institutional Equities in an 8 December report.